January is Radon Action Month. According to Health Canada, radon is the second leading cause of lung cancer and the only way to know if it is in your building is to test. While there is no current specific legal requirement to test for radon, more and more commercial tenants are employers and are requesting their spaces to be tested. Under the Occupational Health and Safety Act, it is the employer’s duty to keep their employees safe from occupational exposures. However, the only way for an employer to know if they are compliant with the Canadian Labour Congress (CLC) or the Naturally Occurring Radioactive Materials (NORM) Guidelines is to have their work environment tested. As a result, proactive property managers who have completed this testing are gaining market advantage. We see highly proactive property management firms completing radon assessments as a part of their BOMA Best applications. When it comes to radon testing, there are short-term and long-term testing DIY kits available. Short-term tests only provide insight as to radon levels during the short time of testing, while long-term tests, allow you to track the levels of radon over an extended period. Short-term testing is prone to missing spikes in radon exposure, whereas long-term testing captures them. It may be prudent to use both types of testing kits, because many different variables affect radon levels, and they can fluctuate at different times of the year. It is good to know the option is always there to test for radon gas on your own, but in most situations, including property management, it is probably better just to hire a C-NRPP-certified radon measurement professional. If you hire a professional, they will oversee the testing process and handle the samples appropriately as to exclude the possibility of compromising the integrity of the test. 1 . Ensures correct testing process and placement. Radon testing can be complicated. The results can be easily swayed by many different variables: preparation of the sampling media, sample collection, processing, packaging and transportation of samples when tests are completed. Accordingly, there are many ways it could go wrong at every stage from setup to time of analysis. Simple things like opening doors or windows, setting up the testing kit for a too short of a time or failing to seal the test kit well for shipment, can cause inaccurate results. C-NRPP certified professionals comply with recognized standards of practice to protect public health and safety. 2 . Unbiased third-party validation results. While most property managers are honest and hard-working professionals, they can still encounter challenges in gaining credibility with their tenants. A third-party licensed, professional test ensures that there is no question about the quality of results. 3 . Transfer of risk and assurance of legal compliance. Both the provincial and federal governments are considering laws to make radon testing mandatory. Using knowledgeable and licensed professionals ensures that you are protected from any errors and omissions. 4 . Actionable recommendations. Once you have the results from the lab, what are you to do with this knowledge? 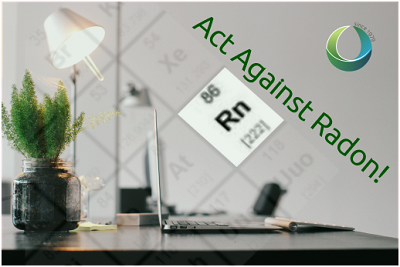 Unlike a test result, radon professionals are able to provide a property manager with a report containing actionable recommendations. This report will specify the scope of any remediation work, save you hours of research and the risk of making any mistakes. T. Harris Environmental Management Inc. (THEM) is a leading Canadian environmental consulting firm in the fields of environmental services, hazardous materials management, industrial hygiene, and occupational health and safety. Our professional staff serve a wide range of clientele including commercial, government, industrial institutional, and residential. We are passionate about health & safety and committed to excellence. Since 1979, we continue to provide high quality services, taking pride in building long-term relationships with our clients. We are dedicated to understanding your concerns and meeting your needs by delivering efficient, cost-effective solutions. Mission: To be the preeminent niche environmental and occupational health and safety consulting firm in Ontario, Quebec and Alberta. Vision: To enhance our position as a premier niche environmental consulting company based on knowledge, innovation, technology, and be at the forefront of emerging EHS concerns and regulatory changes. We will achieve this by further developing our expertise, fostering the growth of our team, synergistic relationships, excellence in performance, and strengthening client relationships. Value Statement: Since 1979, THEM is committed to understanding and providing our clients in the institutional, commercial and industrial (ICI) sectors, with a variety of environmental and occupational health and safety solutions to their concerns. We meet our client’s needs by informing them of their options, reducing risk, anxiety, and formulating qualitative, practical, efficient, and cost-effective solutions.